140 UK groups signed a letter protesting bias on FOIA commission. Some 140 groups have charged that the Commission on Freedom of Information announced in July is biased. The terms of reference for the commission indicate that “its purpose is to consider new restrictions to the Act,” according to the letter. The commission’s five members include two former home secretaries, a former permanent secretary and the chair of a body subject to the FOI Act. One of the members, former Home Secretary Jack Straw, “has repeatedly maintained that the Act provides too great a level of disclosure,” the letter says. Another commission member is Dame Patricia Hodgson, chair of Ofcom, the UK communications regulator. In 2012, Ofcom stated that “there is no doubt’ that the FOI Act had had a ‘chilling effect” discouraging the proper recording of information by public authorities, according to the letter. Whether the FOIA chills intra-governmental discussion is on the commission’s assigned topics. 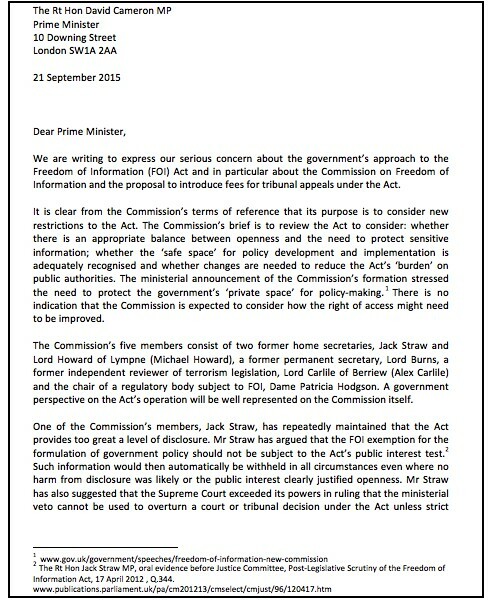 The letter also expresses concern at government proposals to introduce fees for tribunal appeals against the Information Commissioner’s FOI decisions.